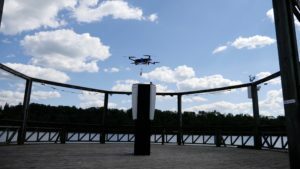 Cleveron has made commercial drone delivery anew reality by offering the customers an opportunity to order cold drinks delivered by drones at a public beach in Viljandi. Never before has drone delivery been that fast. Cleveron promises to fulfill orders in less than five minutes. This drone delivery service demonstrates the future of safe last mile drone delivery. The public drone delivery service is opened for two weeks in Viljandi, Estonia. Any customer is welcome to order a drink via a text message. The drinks are deployed from the other side of the lake via a drone and delivered to the customer under five minutes. It is the fastest response time ever for commercial drone delivery. In addition to being the fastest drone delivery service, it is also the safest solution currently developed. Our drone delivery is safe thanks to a unique drone nest called CleverNest. It allows safe parcel drop-off at the height of two meters, thus removing the danger of the drone hitting someone when landing on the ground or hitting someone with the parcel when dropping it from the heights. Instead, the drone places the delivery to the drone nest at safe heights. Thanks to precision landing, parcels are always delivered safely to the drone nest. The drone service is autonomous and the flight route is pre-programmed, making sure that the drone never gets lost on its way. This drone delivery service represents the future of last mile delivery and in broader perspective, future of e-commerce. None of the existing last mile delivery solutions can compete with drone delivery’s speed. Drone delivery drastically cuts down last mile shipping times. It also enables deliveries to be made closer to the customer by taking the parcels right to the customer’s doorstep.